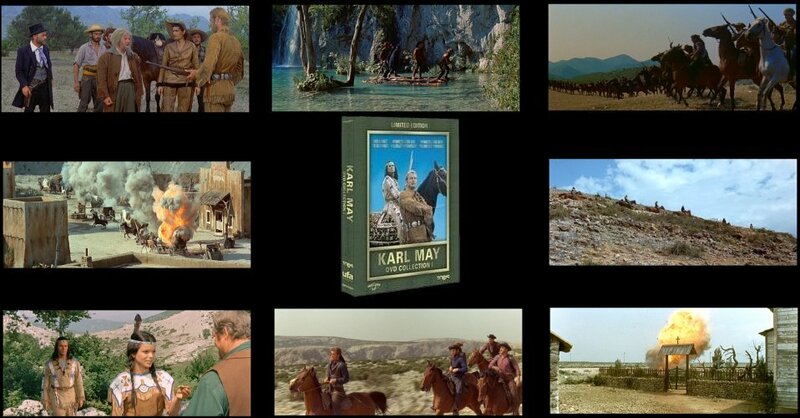 3 film, 3 disc collection of German Karl May Westerns, based on a classic series of Old West novels. Ufa R0 German boxset. Anyone famous in it? American actors Lex Barker or Rod Cameron (Old Firehand) and French actor Pierre Brice play the lead roles. Look out for euro-cult stars Herbert Lom and Terence Hill. This trio of films is a great starting place for newcomers to the Karl May Westerns - it provides a contrast between the adventure tones of Silver Lake and the gritty, Western tones of Half-Breed and Firehand. However, anyone looking for the epic adventure films that the series is famous for will want to see the Winnetou series in box 3. An interview/documentary piece about the three films (22 minutes) in German only. 4 contemporary newsreels/television reports about the films, including interview with the series producer Horst Wendlandt and some interesting behind-the-scenes footage. With German audio only, but plenty to look at. (total 5 minutes). The first, and last two of the Rialto Karl May Western films - solid entries and all enjoyable for fans of the series. The contrast between the epic adventure story of Silver Lake and the gritty tones of Firehand and Half Breed are very apparent and interesting.